I’ve been thinking about it, and I’ve decided that I would like to ‘get to know’ those of you who read my blog, better. That way I’ll have a clearer picture of *who* I’m writing to, so to speak. Hopefully that will make my blog posts more interesting to y’all! 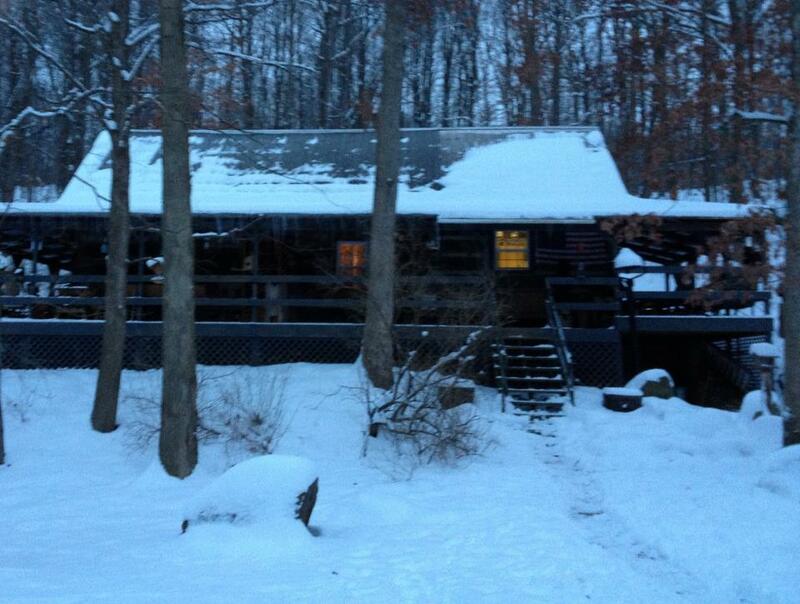 A early-morning snow picture of my ‘adopted’ parents log cabin. So cozy looking, isn’t it? I voted on the polls. =) Good idea! What's your favorite word? So hard! I love Prestidigitation because it's so long, but I also really like Cherish, hope, lovely and wordy. What words or expression do you overuse? “Um” “I know right” and probably a couple others. If you were on Death Row what would your last meal be? I don't know if I'd be able to eat…but I love Chinese. Pets? None sadly. In the past we've had sea monkeys and two hermit crabs, but not for very long. Hi Aidyl! I voted on the polls, they're awesome! Voted the polls! This is a fun idea. I check your blog daily, with the 5 blogs I peek at early in the morning before my writing begins. I don't have a blog though I really hope to get one for writing. Pets? Our ever faithful, ever sweet watch dog, a husky/border collie mix, died this past September. So sad. Hopefully we will get another dog someday…otherwise two cats – Piper and Callie. Family choice names, not my own. I think I would choose something like Longfellow, and Lady Julia. Facebook or twitter? Neither! 🙂 And I don't think I will get either. Unless for writing in the future. This was fun – great to see the polls and everybody's answers!